President Donald Trump’s removal of the United States from the Paris Agreement climate plan won’t provide a lifeline to the ailing coal industry — even in a state like Nebraska that burns a lot of it. 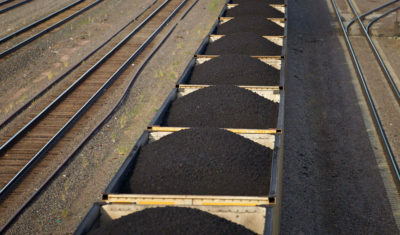 Utilities, railroads and other users and haulers of the black stuff say that when it comes to the move away from coal, the train has already left the station. Photo: A Union Pacific train carries coal through North Platte, Nebraska. The coal industry has seen growing competition from natural gas, wind and solar power. This entry was posted in Nebraska / Midwest News, NewsBlog and tagged climate change, Cole Epley, Omaha World Herald, solar and wind energy expansion in Nebraska on June 12, 2017 by Helen Deffenbacher.